My previous favourite was the Tribal design, but these ones have now reached first place - here are my awesome Cookie Monster nails! I love them. Completely, utterly and totally immodestly, and I feel more comfortable bragging as Robin came up with the actual design, not me. I was so happy with the way Cookie Monster turned out; nothing really went wrong! I slightly changed the way I did the cookies, and wrote a Cookie Monster quote on my thumbs, but other than that it's exactly the same as Robin's tutorial, which you can watch here. 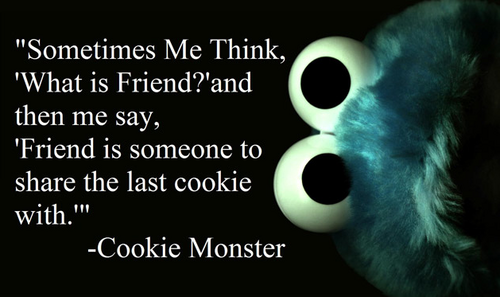 By the way, googling "cookie monster quotes" is hilarious. It's obviously a meme or something; there are heaps of quotes that kind of make fun of normal, serious quotes. Like this. But they're also quite wise, in a cookie-monster way! On my thumbs I split the quote "C is for cookie, and cookie is for me!" Very cute. I wish I hadn't bothered putting in the ampersand though; it wasn't really necessary and it just made it too crowded on that nail. Lesson learned. Still ♥ them ☺. Sesame Street was the best program ever growing up, so this was perfect for me! I think I always liked Big Bird though; he was tall and so was I. I didn't use nail polish for most of this design - as Robin Moses uses paint I decided I would too. I'm slowly deciding that I prefer polish though. The base color is Tender Coral by Jordana. Yay for detailed nail art! And if you think this is crazy, wait to you see my new Little Mermaid nails - they are so cool and I'm never taking them off! I. Love. Nail Art. Love these! That is possibly the most realistic Cookie Monster I have ever seen on nails! And "C is for Cookie" was always one of my faves as a kid! OMG these are SOOO adorable! These are so perfect! Cookie Monster looks amazing! !